Last week the fourth-grade classes took an educational overnight trip to Mazama Lodge in Government Camp. Starting in early December, Middle School students, faculty, and staff began collecting new socks and stashing them in the metal aardvark sculpture in the Middle School lobby. The 15th annual celebration of all things eggnogg-y, NOGFEST, was held in the Upper School Library last week to help celebrate the coming winter break. The Aardvark will take a holiday break and return to your email inbox on Friday, Jan. 11, 2019. Happy Holidays! 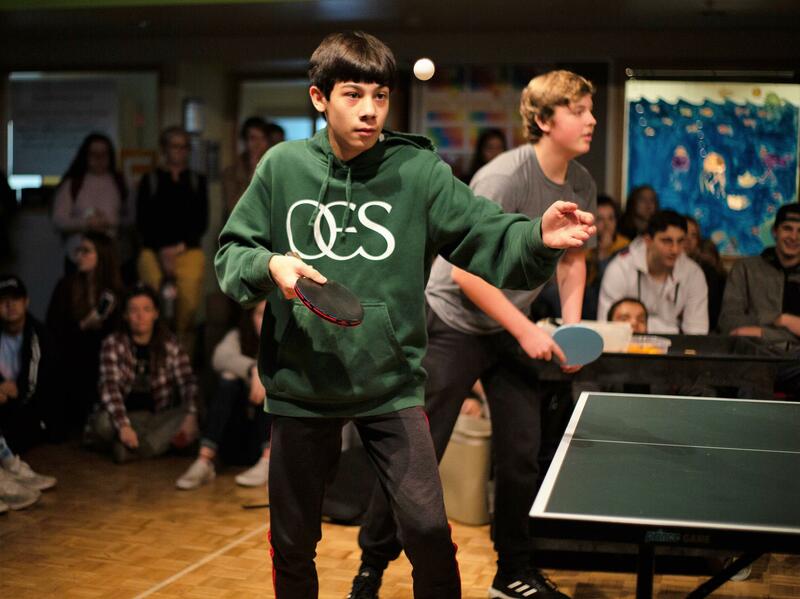 Monday's Upper School Gathering featured the final game of the 2018 Ping-Pong Tournament. After a high-pressure match in front of the whole Upper School, the emerging ping-pong champions were Oscar H. '22 and Dean S, '22 (who happens to be one of the best youth ping-pong players in the country), and the runners up were Thomas H. '19 and Head Boys' Varsity Soccer Coach David Rosenberg.